In light of what I normally post on this blog, it might be somewhat surprising to see a blonde bombshell show up amidst all the wildlife and Heideggerian (!) imagery (albeit in cartoon form)! Yet I also enjoy creating lighthearted illustrations within the realm of pop culture, such as this one. 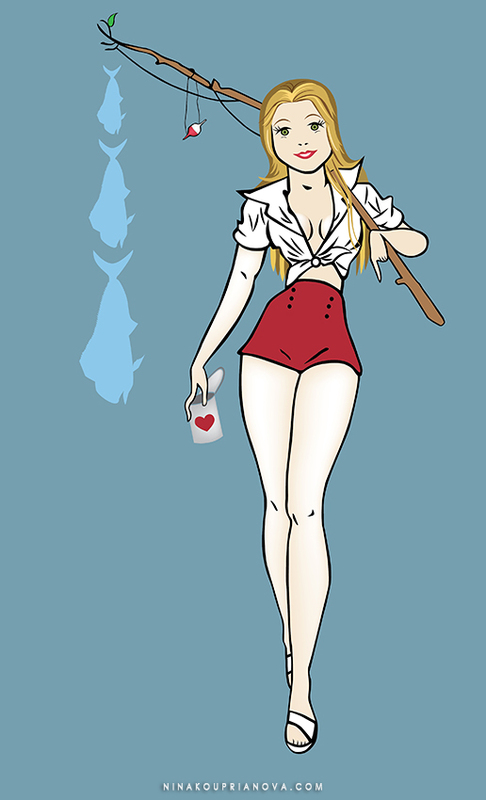 My client requested a remake of a vintage American pin-up with a fishing theme, but with a twist--it had to be transformed into a cartoon portrait of her. (The original was a wavy-haired brunette.) So what I've attempted to do was modernize the image while maintaining the elongated proportions of the original pin-up look.